Since the laundry room gets the best dose of sunshine, we are starting our seeds on the window over the washer and dryer. So far we've sowed the heirloom tomato seeds, both the regular and cherry tomatoes that I bought on my visit to the downtown Mesa Farmer's Market. The dill seeds were harvested from our herb garden this year. 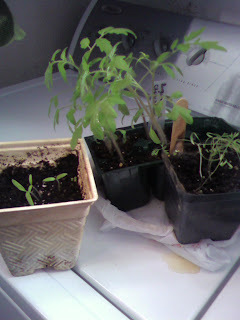 After Christmas I'll be starting more herbs, the other varieties of tomatoes and hopefully some squash and peppers.